Hey Lilyians! 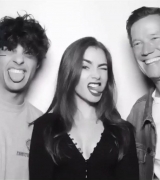 This past Saturday, September 15, Lily attended the CAA Pre-Emmy Party where she had some fun in the photobooth with Noah Centineo and their agent Nick Styne. While we’re still crossing our fingers for more photos, you can view the released ones so far below!